Electrical components such as generator, charge controller, batteries, inverter. The fundamental concept of the natural circulation is the simplicity of operation. The liquid in the collector called "glycol", getting the heat absorbed by the absorbing surface, salt in a natural way. Going enters the kettle placed over the panels and transfers its heat through the heat exchange surface, the sanitary water contained in it. Cools down again in the manifold, establishing thus a natural circulation. 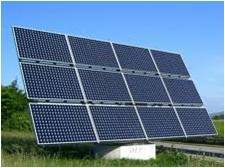 Composition Solar panel (dimensions in cm 200x100x7 - Surface sqm 2): finish painted both the sheathing panel absorbent matt black.